Have you ever thought about how life would have been without communication? For many people, communication is as paramount as breathing and this absolutely turns out to be true. Every day, people spend hours trying to find better ways to communicate with their friends and loved ones. Owing to the advancement of technology, we now have tons of communication channels such as emails, video calls, text, chat, and others. Each of these communication mediums has proved to be useful to man and so we won’t undermine their efficacy. While Emails require a title, as well as letter-length reply and video calls could be frustrating some times, chat seems to simplify all these – just type a short message and you will receive a reply or even an emoji instantly. That’s the beauty of it! The list of chat applications technology has passed on to this generation is quite inexhaustible. Among them is Wireclub, an online chatting platform where lots of people get to meet other users and also chat, play games, and share their profile information with them. As mentioned on their official website, Wireclub is designed in such a way that users are allowed to use more than 140 characters when typing and also discover new things while having great conversations with their friends. To crown it all, user privacy is respected. There’s are so many things you probably didn’t know about this chat service. You’ll get to know them all in this article. 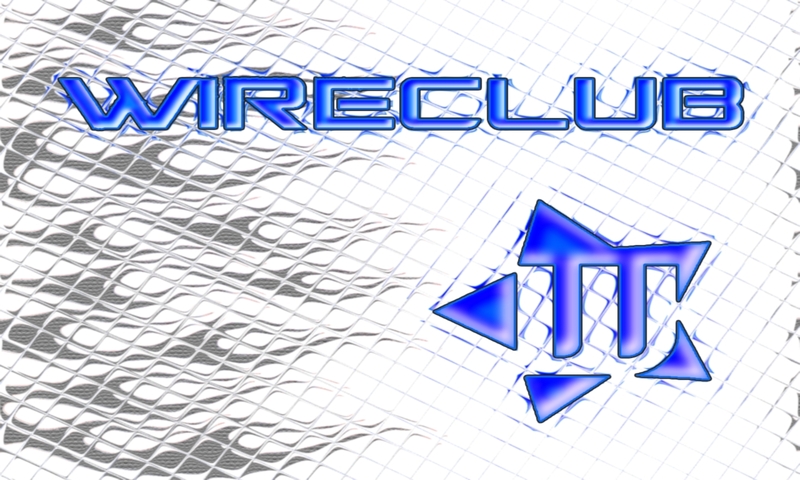 Wireclub is a social network site where people meet to find friends, chat with them, and discover other great things. Since its inception, there has been a great demand for the service Wireclub provides. Information obtained from the company indicates that they currently serve over 7.2 million members who spend an average of 20.2 minutes each time they visit the site. They also added that users exchange more than 1.1 million messages every day and that this number is fast growing. Wireclub boasts a custom high-performance CEP platform that takes care of their messages, which they believe, would be made available very soon for 3rd-party licensing. LewebParis learned that their website – wireclub.com – operates under the supervision of three dedicated full-time staff members as well as a wonderful team of volunteer moderators. In addition to this, is their incredible self-developed set of automated moderation tools such as robot moderator. The company also have licensees using its technology to manage its own online businesses. If you want to join Wireclub’s free online chat, message your friends directly, and also have access to their rooms, you need to create your own account. All you need to do is to agree with their Terms of Service and then click here, type in your Email address and choose your password to become a member. Once you successfully register your account, simply click here, enter your username and password and click the Log in In button. Like every other chat service, Wireclub has organized rooms where members meet and relate to one another. These rooms are for the public and everyone can easily join in and flow with other users. They are not structured like private messages, where a user directly communicates with another colleague rather whatever message a user shares in the room can be seen and read by other members. 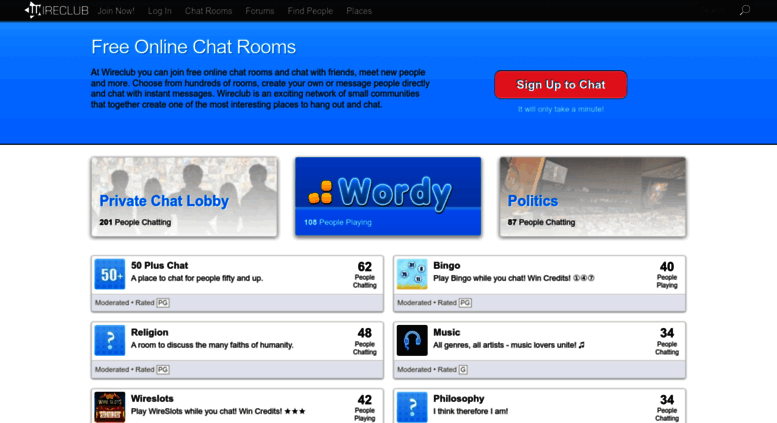 Wireclub has interesting chat rooms created for several purposes. However, users can as well create their own room and invite their friends to join them. You don’t need to have an account to do this and any room you created will also be the same room the website will use. Private Chat Lobby, Wordy (a game world), Politics, 50 Plus Chat (for people above 50 years), Wireslots, Music, Philosophy, Goose Table, Atheism, Religion, Science, Keno, Leopard Table, Blackjack, Slots, Poker, Wireclub help, Self-Improvement, Duck Table, Travel, Lounge, Technology, Education, Dating, Sports, Off Topic, Health, Animals, International Meeting Place, Movies, Book, Food, Parenting, Trivia, 30s Chat, Games, Jaguar Table, The Hangout, Cars, Fashion, and 20s Chat. Everything Curvy, Oldermen for Females, Curvy women, Dating Older, Fantasy Factory, Lesbian Cafe, Rock Hounds, Chat, Flirt, or Play, Calligraphy and Handwriting, Paganism and Polytheism, Jesus Christ 101, Compulsory Military Service, Love and Friends, Ask Female Anything, United Rockers, Islam The Religion of Peace, Unhappily Married, Senior Moments, Photography Lovers, Ladies Only Chat, Gay and Bi Men, Lesbian Cafe, Working at Stripclub, Bi Curious and Even Married, and many others. Now you know the rooms available on Wireclub, when next you log into your account, feel free to join anyone you like, make friends, and have a memorable time with other members. With the Wireclub app, you can easily meet new people, chat with them and also discover interesting things on your iPhone. To download the app, click here and carry out the instructions that follow. It doesn’t require special knowledge. There is no doubt that Wireclub is very easy to navigate and use. It is very easy and fast to find a chat room and every feature on the site is user-directed and clearly signposted. So, there is nothing that slows anyone down on the site. Perhaps, this could be the reason they have many members and also having a smooth ride. Of a truth, the effort of Wireclub’s management team cannot be ignored because they make chat enjoyable for everyone. This only takes a minute to complete. You just need to have your email address handy and also pick up a password you can easily remember. After entering them in the provided spaces, you are expected to click ‘continue’, which automatically means you’ve agreed to Wireclub’s terms and conditions. That’s quite standard as well. The next thing is that you would be requested to provide info like your gender; a little bio about yourself, a username; your date of birth; actual/real name; your current city of residence; your photo, and favorite color! You can also retrieve your profile information from your Facebook account, making the registration process quicker and easier. When it comes to customer support on Wireclub, there is very little alternative. The site also features a hidden-letter captcha process as well as plenty of information for users’ consumption. In addition, members can easily reach out directly to site administrators, who have their personal profile pages too. However, it is not certain how helpful or quickly their response could likely be. Wireclub has a set of rules that all users must abide by as well as some regulations about posting inappropriate/adult materials. Bullying and spamming are not tolerated and the site owners take action actions like suspension and banning against defaulters. Generally, we can say Wireclub appears to be a safe place to meet people and have fun. There are not many complaints or negative comments about Wireclub from users. Like most chat services, they have a marketing strategy that pushes unsolicited messages and automated messages across to users. Apart from this, the Wireclub website is one smart platform to have fun and meet new people from all walks of life. The site has an overwhelming number of satisfied users even though their customer service cannot be wholly relied on. But that shouldn’t bother you since the site is easy to navigate. Because of all these merits, we recommend you give Wireclub a try.